Think fraud won’t happen in your organization? You need to know how vulnerable your operation really is. Learn from others' mistakes. Check out these case studies detailing how past fraudsters operated. 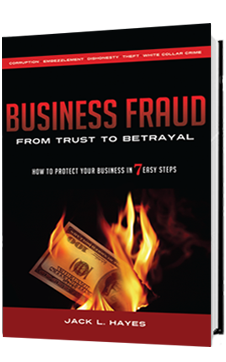 Get Jack Hayes’ full biography detailing his extensive experience in preventing business fraud. Internal fraud is costing U.S. companies over $500 billion annually. The six devastating internal fraud-producing mistakes most often made by management. Why it is a huge mistake to rely on auditors to keep your workplace free from fraud. The three factors consistently creating the greatest internal fraud risks in any operation. The primary reason these crimes continue to thrive in today’s high-tech world of crime fighting. Change your way of thinking if you believe your operation is not at risk to fraud. Learn where, why, and how these crimes occur; get an eye-opening look at who the fraudsters really are, and discover the most effective ways to defeat them. Find out how REALLY vulnerable your operation is to fraud and embezzlement. Discover a new, smarter way to combat fraud—a method that will give you a giant head start on the path to Preventive Management, the unique edge in internal fraud prevention.